No, I am not referring to the African lion,which is more of savanna species. I am referring to the largest of all the wild cats and the true king of the jungle, Panthera tigris. 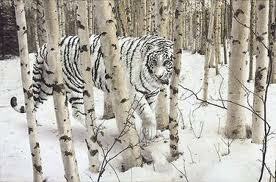 Throughout much of its range the tiger is a true jungle species preferring dense cover. The exception to this is the Amur tiger, Panthera tigris altaica, which roams through the forests of Russia (formerly known as the siberian tiger). Currently, his majesty’s reign as king is being threatened. Tiger populations through out Asia have been decimated. A century ago there were an estimated 100,000 tigers. Now experts say there may only be about 3,200 tigers left in the wild (Dybas). Tiger populations have been in decline for several reasons. Most prominent among these are habitat loss and poaching. Tiger habitat has been severely reduced by logging and development. Tigers have been reduced to a mere 7% of their historic range (Walston). Much of this range has been reduced by unsustainable logging practices and over harvests. There is also a current initiative to develop floating hotels and casinos in the sunderbans, one of the remaining tiger strongholds. It is absolutely vital to protect what habitat still remains for tigers. Poaching has likely had an even larger impact on tigers than habitat loss. Like rhinos tigers are used in traditional asian medicines. As such they are under constant pressure from poachers. In 2005 India was shocked to discover that poachers had eliminated all tigers from the Sariska Tiger Reserve, an area they had believed was a well-protected sanctuary (Dinerstein). If tiger declines continue at their current trend experts predict the complete extinction of tigers by 2022, ironically this is also the next year of the tiger on the Chinese calendar (Titova). A news report from India announced increases efforts between government and civil organizations to protect the country’s remaining tigers.